Archbishop Francis Bible Schulte, 89, a Philadelphia priest who rose to be superintendent of schools, auxiliary bishop of Philadelphia, bishop of Wheeling-Charleston (West Virginia) and archbishop and archbishop emeritus of New Orleans, died at Mercy Fitzgerald Hospital, Darby, on Sunday, Jan. 17. Archbishop Schulte’s funeral Mass will be celebrated at St. Louis Cathedral in New Orleans at 2 p.m. on Thursday, Jan. 28. Entombment will follow in the St. Louis Cathedral crypt. A Philadelphia Mass in memory of Archbishop Schulte will be celebrated by Archbishop Charles J. Chaput on Monday, Jan. 25 at the Cathedral Basilica of SS. Peter and Paul. Reception of the Body will be held at 9 a.m. followed by a viewing. The Mass will follow at 11 a.m.
Archbishop Schulte was born in Philadelphia during the Christmas season in 1926, the only child of Francis Schulte, a pharmacist, and Katherine Bible Schulte, a nurse. Although his birthdate was Dec. 23, his parents told him it was Dec. 25. He did not discover his real birthdate until he had to obtain a birth certificate to enter St. Charles Borromeo Seminary. “Oh dear, your father and I talked it over and thought it would be nice,” his mother confessed. He probably agreed because he continued to use the Dec. 25 birthdate until he left Philadelphia for Wheeling in 1985. His heritage was German on his father’s side, Irish on his mother’s side, but “you’re 100 percent Irish if your mother is Irish,” his maternal grandmother assured him. That may be, but his priestly DNA came through the paternal line, although his mother’s sister was a Sister of St. Joseph. His great uncle Augustine Schulte was a rector at the North American College in Rome and professor at St. Charles Borromeo Seminary; his uncle, also Augustine Schulte, was pastor of St. John Vianney Parish, Gladwyne. Raised in St. Benedict and Holy Angels Parishes, he was schooled at Norwood Academy and St. Joseph’s Preparatory School. From an early age he considered the priesthood, but it was the death of his father on New Year’s Day, 1938, when he was 11 that his intent was solidified. Grief stricken he went to pray at the nearby Carmelite Monastery. There he poured his grief out at a shrine to St. Therese of Lisieux. “I’m convinced that was where the Lord called me,” he recalled in a 2006 interview. After St. Joseph’s Prep he entered St. Charles Borromeo Seminary and was ordained May 10, 1952 by Archbishop John F. O’Hara, who was in his first year as Philadelphia’s ordinary. Although dwindling today, Archbishop Schulte’s ordination class was and remains a remarkably close-knit class. Bishop Louis A. DeSimone was also a member of the class and the eldest because he was a World War II veteran. As a newly ordained priest, Father Schulte was sent to Roman Catholic High School as a teacher, and two years later to Central Catholic High School in Reading, where he remained for six years. He was then called back to Philadelphia by newly appointed Archbishop John Krol to serve first as assistant superintendent of schools and then for 10 years as superintendent of what was a huge school system. During part of this period he was in residence at the former St. Stephen Parish on North Broad Street. Also there was Father (now Bishop) Robert Maginnis, who was assistant director for the Department of Youth Activities. The two became friends and often, after morning Mass, they would go to Pier One for a bit of tennis, then shower and head into their center city offices. Interestingly, although working in education, it was not a career path he would have deliberately chosen. In post-ordination graduate studies at the University of Pennsylvania he opted for political science and labor relations, something that did help in in school administration. “You went to St. Joseph’s Prep, why didn’t you become a Jesuit?” Cardinal Krol asked him during an automobile ride. “Because I didn’t want to be a teacher,” he replied. The cardinal, dumbfounded, said nothing. A few months later he was named pastor of St. Margaret in Narberth and he loved it. It wasn’t very long after this that Cardinal Krol invited Msgr. Schulte, Msgr. DeSimone and Msgr. John Foley to his residence and dinner with a special guest, Archbishop Pio Laghi, the papal nuncio. They may not have been aware of it at the time but it was apparently a screen test. In August 1981, Pope John Paul II named Msgr. Schulte and Msgr. DeSimone bishops and appointed them auxiliary bishops for the Archdiocese of Philadelphia. Their episcopal ordination took place at the Cathedral Basilica of SS. Peter and Paul with Cardinal Krol as the ordaining prelate. Msgr. Foley would have to wait a few years longer; in 1984 he was named archbishop and appointed to head the Pontifical Council for Social Communications at the Vatican. While keeping the pastorship of St. Margaret, which he really loved, Bishop Schulte picked up new responsibilities including the chairmanship of the Cardinal’s Commission on Human Relations and Urban Ministries, which was a very major outreach program during Cardinal Krol’s administration. “I followed a great man in this, Bishop John Graham,” Archbishop Schulte later reminisced. His tenure as an auxiliary bishop was short. In less than four years, in July 1985 he was appointed sixth bishop of Wheeling-Charleston, West Virginia. His new diocese covered the entire state of West Virginia, and while it was geographically 10 times as large as the Archdiocese of Philadelphia, the Catholic population was less than 100,000 and one-tenth the size of his home diocese. “The pope must have a sense of humor sending a city boy to such a rural area,” Archbishop Schulte later remarked. He also came to appreciate the special gifts of southern and rural America. “People came to church early and stayed late and the Catholics of West Virginia understood stewardship,” he later said. His stewardship was relatively brief in West Virginia. In February 1989 Pope John Paul II appointed him Archbishop of New Orleans, the 12th archbishop of that historic see. It is a diocese with a long Catholic history, tracing to 1793 as a diocese and much longer as a Catholic community, predating even Philadelphia. Like Philadelphia, there was a mix of many nationalities including French, Irish, German, Slavic and African Americans. Unlike Philadelphia, he noted many of the African Americans were Catholic, and several of the bishops in the area were also African American. Just as Philadelphia has a 19th-century Redemptorist saint in St. John Neumann, Archbishop Schulte took great pride in that the cause for 19th-century Redemptorist Blessed Francis Xavier Seelos reached the beatification stage under his watch in 2000. As the archbishop of a major diocese Archbishop Schulte served on many boards, but one of which he was most fond was the Catholic Near East Welfare Association, a papal agency that assists Christians in the Holy Land. He remained on the board of directors for over two decades, according to Michael J.L. La Civita, the organization’s communications director. 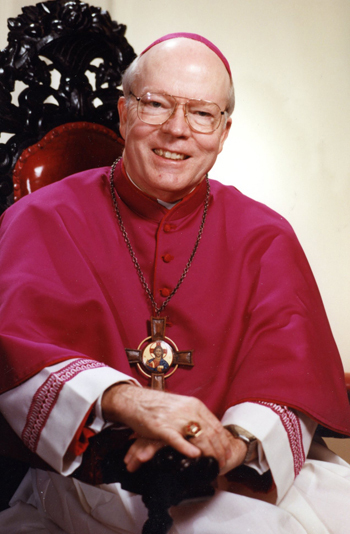 Archbishop Schulte served the people of New Orleans well until his January 2002 retirement. His immediate successor, Archbishop Alfred Hughes, told the New Orleans archdiocesan newspaper, The Clarion Herald, Archbishop Schulte’s biggest contribution to the Archdiocese of New Orleans was to “bring an organizational structure to the archdiocese,” he said. “He was very consultative and he introduced consultative bodies as genuine consultative bodies. He developed the cabinet structure. That basic structure I inherited and did very little tweaking of it. After his retirement Archbishop Schulte returned to Philadelphia for medical care and up until four years ago lived with his old friend Bishop Maginnis at St. Edmond’s Home for Children. Most recently, as his health deteriorated, he resided at Villa St. Joseph in Darby, the archdiocesan residence for retired priests. In lieu of flowers in remembrance of Archbishop Schulte, donations are requested for Villa St. Joseph, 1436 Lansdowne Avenue, Darby, PA 19023-1298. NEXT: Pro-lifers plow ahead with plans to march in D.C. Thank you so much Lou Baldwin for the beautiful story of Archbishop Schulte. It has been 45 years since I have seen him which was upon the occasion of my taking the 8th grade test for High School in his office near the Philadelphia Cathedral. Long story short, my Dad was a career Air Force guy and we moved a lot…I went to 8 different Catholic and public schools. My parents were from Philly and I longed for the ‘parish’ life and as luck would have it, my Dad retired so I could go to one high school. I had to take the 8th grade test in his office because we had just moved to the area in August just before school started. Somehow, my German grandmother knew him personally, so I had and ‘in’ if you will and was honored to become a Prendie girl, then Villanova grad. He will be missed. My only regret is that I didn’t look him up sooner to pay one last visit to him before he passed. He was a wonderful man who made a huge impression on 14 year old girl.